This entry was posted in Uncategorized and tagged forgiving, grounding oneself, little hurts, mercy, peace. Bookmark the permalink. Forgiveness is freedom. So well done, Debbie. So true, John. Thank you for summarizing so beautifully! Very nice. And so true, too. Thank you, Dawn. I’m glad it resonated with you! Debbie you shared a WEALTH of inspiration and truth in this post. Yes, because revenge and bitterness only keeps us attached to hurts. It’s very to do at times, but forgiveness is a release from from thoughts and emotions that keep us prisoners. Thanks so much for sharing this today, my friend. Great post! Love the photograph you share too. It’s beautiful! 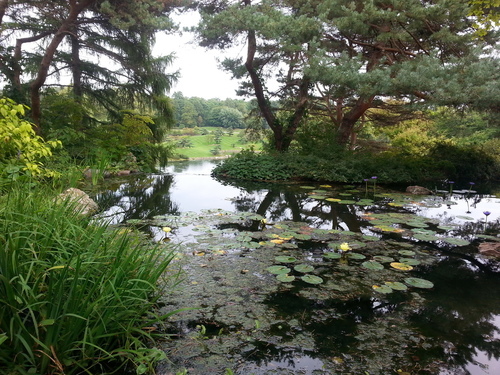 That photo came from a trip to the Botanic Garden in Chicago. I love how peaceful it looks, and I’m glad you liked it, too! Ron, thank you for your kind words. You know I’m no poet, but I’m delighted when my friends encourage me to express myself in verse. You’re so right in saying that revenge and bitterness keep us attached to hurts. And when we’re feeling that way, we come to a standstill. Forgiving, even when it’s hard and often when we don’t see the fault as being ours, is key to moving forward. And can’t we build those little things up into big things? The phrase about making a mountain out of a molehill comes to mind — just what you were saying, in a slightly different way. Letting go of resentments, a sense of being offended — all of that — is hard. But, just like any life skill, it gets easier with practice. Our society has decided that being a victim is a good thing, so deciding not to be a victim can be a hard thing, too. But it’s possible — thank goodness. “Making a mountain out of a molehill” expresses it well, Linda. We all do it, to some extent. Perhaps we’re more apt to do it when we’re feeling particularly vulnerable or incapable. Maybe some of us just need more sleep! You know, FF, you’ve brought up a good point. I wonder why people slight others when they know how hurtful it feels. You’d think those who have been hurt would be the first ones to stop casting stones, but too often they’re the very ones inflicting the most pain. Hmm, probably a correlation there, but I don’t see it right now. Thank YOU, Virginia, for dropping by and reminding us that shutting that tape recorder off is so important. I suppose we all need to develop “selective memory,” keeping in the forefront of our minds the compliments and nice things people say rather than dwelling on the barbs!